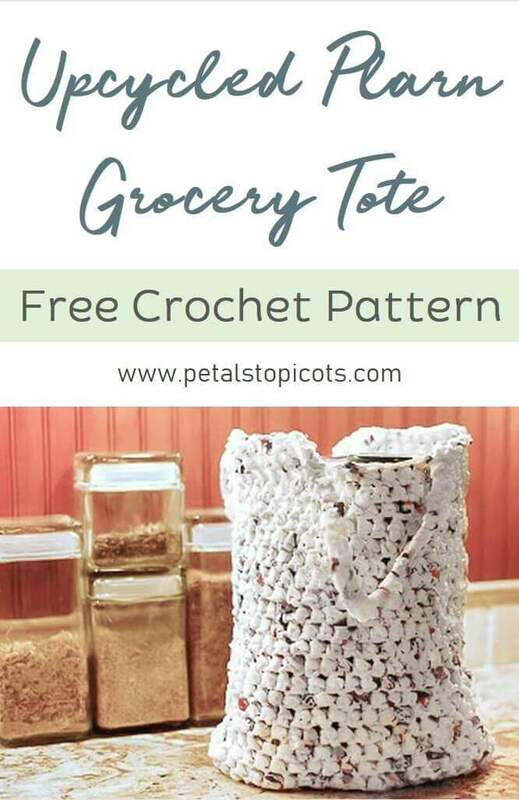 Stitch up this quick and easy plarn grocery tote pattern for a sturdy and reusable bag to carry your groceries. The great thing about this bag, in addition to recycling your plastic bags, is how surprisingly durable it is and that it can be washed in warm soapy water, air-dried, and be used again and again. What is plarn? Plarn = plastic + yarn. You can read more about it and how to make your own in my tutorial, How to Make Plarn. Finished bag measures approx. 15 in. × 12 in. Round 1: 2 hdc in 3rd chain from hook and 1 hdc in next 8 ch, work 5 hdc in last ch, working along opposite side of the chain, work 1 hdc in the next 8 ch, 2 hdc in last ch, join with a Sl st in top of beginning ch-2 — 26 sts. Round 2: Ch 2 (counts as hdc here and throughout), 2 hdc in same st as join, 2 hdc in next st, 1hdc in each of the next 10 sts, 2 hdc in next, 3 hdc in next, 2 hdc in next, 1 hdc in each of the next 10 sts, 2 hdc in last st, join with a Sl st in top of beginning ch-2 — 34 sts. Round 3: Ch 2, 1 hdc in same st as join, 3 hdc in next st, 2 hdc in next, 1hdc in each of the next 14 sts, 2 hdc in next, 3 hdc in next, 2 hdc in next, 1 hdc in each of the next 14 sts, join with a Sl st in top of beginning ch-2 — 42 sts. Round 4: Ch 2, 1 hdc in each st around, do not join (work in a spiral from here on; use a stitch marker to keep track of rounds) — 42 sts. Round 5: 1 hdc in top of ch-2 from previous round and in each st around, do not join — 42 sts. Round 6: 1 hdc in top of first hdc from previous round and in each st around, do not join — 42 sts. Rounds 7 through 23: Repeat Round 5. Round 24: 1 hdc in first 13 sts, ch 23, skip next 8 sts, 1 hdc in each of the next 13 sts, ch 23, skip next 8 sts — 72 sts. Round 25: 1 hdc in top of first st from previous round and in each of the next 12 sts, work 38 sc over ch-23 to cover, 1 hdc in each of the next 13 sts, 38 sc over ch-23 — 102 sts. Round 26: 1 sc in each of the next 2 sts from the previous round, Sl st in next st to join. Fasten off, weave in ends, and enjoy! Love this! I have waaaaay too many bags that need a good purpose. I did have a couple of questions, though. First, does this bag stretch to a larger size to accomidate things like cereal boxes? If not, how can I make it bigger? Thanks! Hi Kayla 🙂 It does have a small amount of give to it but not as much as yarn would. I can’t believe that you can crochet all of those bags together. I am a fan of recycling and love to crochet. I might have to try this sometime. I usually end up donating my plastic baggies to the daycare that my son used to go to. Love love love this!! I made a large grocery tote and everyone who sees it loves it! Now I have everyone collecting their bags – lol. I may try the doormat idea too – sounds great! Just found your site – good pattern! I’ve made plarn bags in the past, but with a twist. I use a strandof plarn and a strand of leftover yarn together. Didm this as I was unsure of the strength of the plarn by itself. Any acrylic yarn will do – variegated works well, making an interesting tweedy pattern. I have a fairly large stash of bags which I guard jealously, as many communities in my area have outlawed single use plastic bags. Will definitely try your bag pattern next time I make a tote. Yes, that does help. I was thinking you were saying to make 34 stitches but I get it now. Another mistake I made is that I was using different types of plastic bags. Some were stiffer than the regular grocery bags. When I crocheted them with the others, it created an uneven, lumpy effect. Fortunately I was only on the foundation round when I figured it out. Thank you so much for your help. I am looking forward to finishing my new tote. If you want to use stiffer bags because of color, cut the strips smaller to make them less lumpy. I’ve gotten better at judging how wide to make the strips based on the thickness of the bag, but I often cut off one strip and do a quick chain with it to check the thickness before I cut up the rest of the bag. I like the idea of using this for a door mat. I would think a door mat would be thicker than the totebag so would you recommend making the strips wider to make the thicker door mat? This is such a wonderfull idea. Thank you very much for posting it. I can’t wait to get started. Thank you Kara, I will try that. Thank you for responding so quickly. I am so new to this blogging stuff I was not sure I posted the question right. I will let you know how it works and if it looks good I will try to post a picture. Thank you again. I was at a laundromat many years ago. A lady there opened a package she had received in the mail. It was 2 doormats crocheted from bread bags. She just laughed and brought them over to show us. 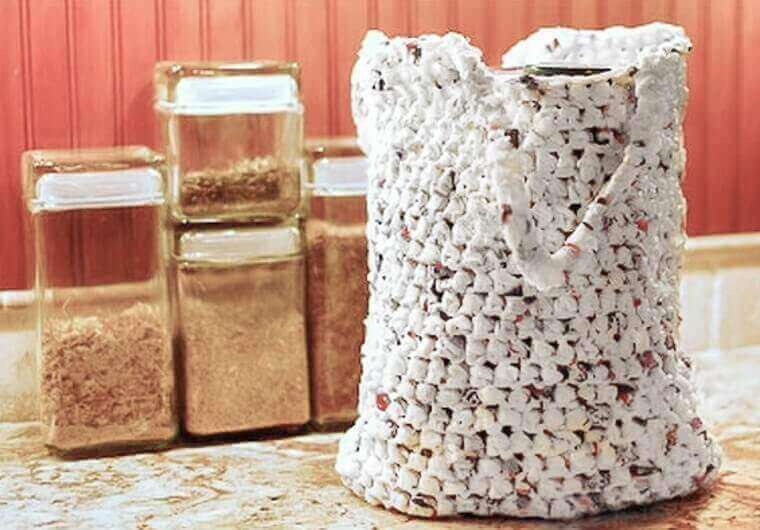 She couldn’t believe her Mom had made them from bread bags! I had forgotten all about it until I saw this pattern today. I should make both a bag and a mat! I sure have plenty of bags! Hmmm … I think I would try to reuse the portion I pulled out unless it seemed really shoddy. I think the condition of the used plarn would determine the quality of the final project. It really would vary from project to project. I would just use your best judgement. If in doubt, just use new plarn; it would stink to invest time into a project where you wouldn’t be happy with the final result. Hope that helps 🙂 Let me know how it works out. Thank you so much for joining JAQS Studio’s Linky Part. I featured your project today :). This is awesome! The result looks so professional! Thansk for sharing! Happy weekend! I wanted to let you know I posted a follow up on your Plarn on this weeks linky party! I would love it if you would stop by and link up again! I definitely will!! Thanks, Kim! This is a really amazing project.I have to try this! Wow this is so neat! New follower! I was so looking forward to this post! After you added a new word to my vocabulary last week, I was anxious to see what came next! These bags are just so much fun! Thanks for sharing! What a great idea you have given me 🙂 Thanks for visiting my site! What size crochet hook did you use? Maybe I overlooked it in the directions but I can’t seem to find it. And will it work like yarn in the sense that if I want a bigger bag I can just use a bigger hook instead of a whole new pattern. I am very anxious to make plarn and make this bag! This is so awesome – I pinned it AND the tutorial on how to make Plarn – putting this on my to-do list! I made a wood carrier out of plarn and it works great. I can carry a lot of wood in at once instead of one or two at a time. What a great idea! I would love to see it. Do you have a pic you could show? What a great idea, do you have a pattern to share or just wind it? I can not believe its plastic.. Kara it’s so neat and a spectacular idea.. I especially love the fact that it’s Green.. Thanks so much for linking at Craftionary.. I pinned this! So cute and seriously sometimes I feel like I am overrun with plastic bags. Surprising considering I have TONS of fabric totes that I bring to the store. Thanks so much for sharing at Taking A Timeout Thursday! Just curious… how strong are they? other wise i think this is really an amazing idea. Oh this is so cool! I am totally sharing this with my readers! I am featuring this today at somedaycrafts.blogspot.com. Grab my “featured’ button. What a great project! Won’t you consider sharing it with my readers at sassafrassalvation.blogspot.com/2012/01/architectural-salvage-jewelry.html. Thanks! Happy New Year! Great idea! I’ve got to send this on to my daughter who crochets. 🙂 Thanks for the pattern.